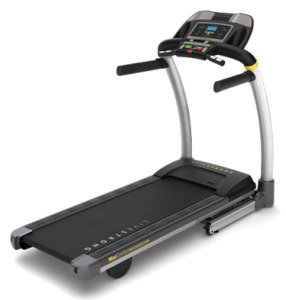 The all-new 2010 Livestrong LS12.9T treadmill offers the cool features you’ve been looking for including a big 60" running belt, a 14-degree incline, advanced deck cushioning, and a powerful 3.0 motor. The well-lit LED display windows on the Livestrong LS12.9T treadmill show time, distance, calories/heart rate, speed and incline. A Livetrack LCD window displays the Livetrack™ Fitness Journal information. In the 14 pre-set programs you get Manual, Speed Intervals, Peak Intervals, Weight Loss, Rolling Hills, Foothills, Mountains, 5K/10K, Race, Custom, Target Heart Rate Zone, and HR Intervals. Unit Weight/Dimensions — 249 lbs; 79" x W: 36" x H: 58"
UPDATE: Livestrong Fitness is out of business, and the company is no longer making exercise equipment. 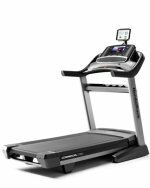 Check out NordicTrack as well as Johnson Health Tech's other popular brands, Horizon and Vision for comparable treadmills. The $1299 Livestrong LS12.9T treadmill comes backed by one of the best warranties in the business: a strong 5-year parts and a 2-year labor warranty, in addition to lifetime coverage of the frame, motor, and elevation motor. It offers a 14% incline range in 0.5% increments allowing you to maximize your time spent in your workouts, as well as advanced programming, a database fitness journal, and chest strap/contact grips for heart rate monitoring during training. 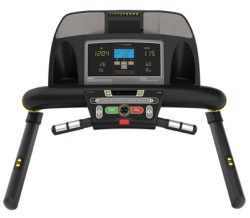 Users are impressed with the Livestrong LS12.9T and express satisfaction in treadmill reviews posted online. The acceleration and incline operate smoothly, and the machine is sturdy at high speeds while running. It has an attractive layout of the console and it comes with toggle controls on the handles. The speakers are not as good as what you get on the 16.9T, but beyond that, there are few downsides to the LS12.9T. If you are in the market for a treadmill under $1300, your selection just got a lot more interesting. The Livestrong LS12.9T treadmill earns its place among the top spots. Only time will tell if the 12.9T measures up in reliability when compared with the best-selling Sole machines, but for power, cushioning, belt size, noise level, warranty, and value-to-price ratio, the Livestrong enters the market as a very strong competitor and the one to watch. It rates a Good Buy.